Hey party people. Are you ready to introduce your kids to the Melbourne Shuffle, and throw some shapes on the dance floor with your brood? Now is your chance, thanks to UK Family Rave organisers Big Fish Little Fish who are about to bring their award-winning dance parties to Victoria's capital city. 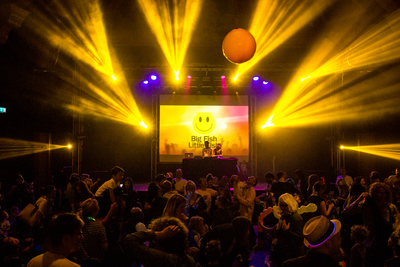 Big Fish Little Fish have been running family-friendly raves since 2013. 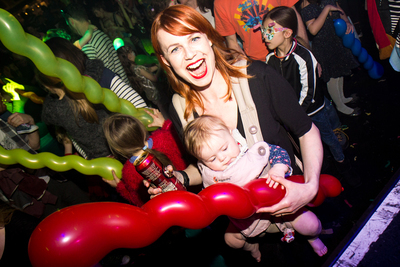 Crowds of up to 500-800 have been raving it up in venues across the UK, and now it's your turn to put your hands up in the air with your tykes. The Big Fish Little Fish crew are all set to raise the roof off the La Di La club in Little Bourke Street with the launch of Melbourne's first BFLF Family Friendly Rave this July. Melbourne's launch party on 4th July has already sold out, but fear not party people, there are still tickets available for the next event: 'Under and Over the Sea' Family Rave at the La Di Da club on Little Bourke Street on Sunday 23 July, from 2-4pm. A third date will be added very soon. Craft tables with giant mural, themed crafts and playdoh table. Optional (but highly encouraged) fancy dress: Over and Under the Sea - big fish, little fish, octopuses, sailors, pirates, mermaids. Sound levels safe for ears of all sizes. “There’s a perception that when you have kids, you stop having ‘grown up’ fun. But family raves are the place for adults and kids to let loose together” explains Melbourne Manager Emily Synnott. “Kids love seeing their parents have fun and parents often tell us that BFLF has given them back a little piece of themselves”. Big love. Fun times. Big fish little fish, cardboard box. See you there family ravers! Costs: Pre-walker: free, $12 child, $20 adult (pre-sale tickets, prior to July 3rd).